The subject of this paper is the analysis of stress distribution of the pipeline branch in hydropower. Pipe branches are widely used and very in complexity of the shape. Behaviour of the pipe branch subjected to the internal pressure was analyzed both numerically and experimentally. Analytical stress calculations are limited on the simpler forms of branches, so numerical calculations had to be used. Focus of numerical analysis was on determining critical locations and its values. Strain gauge method was used to measure greatest stress concentrations on the defined locations. Experimental results were very close to numerical calculations. Material used for manufacture of the pipeline branch is NIOVAL 47. This paper can be used as the base for the future researches concerning stress distribution in other branches among the pipeline both numerically and experimentally. The paper describes promising structures of clip (friction-screw) connections with incomplete sweep of shaft used in the axial fans of pressurization of gas pumping units. The contact problems of interaction between semi-hubs and shaft for the generally asymmetric relatively the joint bolt connections are formulated. Two types of interaction are investigated: with and without lateral displacement. Based on a priori assumption about the distribution laws of contact pressure accepted in traditional courses of “Machine Details” an engineering method for calculating of clip connections is developed. Herewith different types of details coupling (with a gap, matched, with tightness) correspond to concentrated, cosine and sustainable (linear) distributions of contact stresses. There are determined an analytical dependences of limited moments and breakloose forces on spanning angles, bolt tightening force and tribological properties of joined parts of subassembly. The examples of comparative calculation for the variants of clip connection have been presented. The article deals with effect of the nano-fluids on the performance parameters of heat pipes. Stainless steel heat pipe was filled with a nano-fluid, a solution of copper sulphate and ferric chloride, up to 20% of the total volume of the heat pipe. Solutions of the nano-fluids were produced in the following concentrations: 1%, 2%, 3%, 4% and 5%. The performance parameters were measured on the experimental setup. The experimental measurements were carried out for different operating temperature and measured results show that the concentration of working fluid has effect on performance of the heat pipe. A cylinder bundle is a portable assembly which consists of a frame and two or more cylinders, each of a capacity up to 150 l and with a combined capacity of not more than 3000 l, or 1000 l in the case of toxic gases, connected to a manifold by cylinder valves or fittings such that the cylinders are filled, transported and emptied without disassembly. The type approval of the cylinder bundle covers series of tests regarding its structure and its behavior during and after the tests. The research, presented in this paper, is focused on virtual testing, i.e. modeling and simulation of a cylinder bundle drop tests. First, a CAD model of a cylinder bundle which contains five cylinders is built, and then a vertical and rotational drop tests are simulated in virtual environment. The obtained results are analyzed in line with the demands defined in the international standard ISO 10961:2010(E).They could serve as a base for further improvement of the model and point out the possibility for validation of the virtual testing. The subject of our study is the effect of the tempering duration /for up to 7 hours, at 180°C/ on the mechanical properties of 20CrMo5 quenched steel samples. Possibilities were studied, including through eddy currents, to control the final tempering of parts which have gone through carburizing, double-quenching and interim high-temperature tempering. The parts were 20CrMo5 steel shafts, which had their carburized layer removed in certain zones before the thread was made. It has been established that a strong correlation exists between the HV50 quality indices and the eddy currents characteristic Z. Copper final slags containing 0.62% Cu, 1.07% Zn, 0.08% Co and 32.5% Fe as the most essential components were subjected to chemical (by means of sulphuric acid and ferric ions) and biological leaching by means of chemolithotrophic microorganisms of three different types: mesophilic and moderate thermophilic bacteria and extreme thermophilic archaea, with temperature optimum at 37, 55 and 75 degrees Celsius, respectively. The leaching was carried out by the shake-flask technique and in agitated bioreactors. The highest rates of extraction of the non-ferrous metals and iron were achieved by means of some archaea but at relatively low pulp densities (5 – 10%). The moderate thermophilic bacteria were the most efficient for the leaching at a higher pulp density (within 15 – 20%). The analysis of stress-strain state non axis symmetric drawing process, which was developed based on an analytical model of the process. Obtained the dependencies for the components of the stress in the plastic region. The relationship between changes in the district velocity compressive stress on the peripheral area of the amount of shear stress. On this basis, it is given a numerical grade to increase the limit drawing ratio slightly different from equivalent value determined by the equality of the greatest meridional stress to the yield strength of the material at dangerous section of the blank. The fatigue of metals is a relatively new part of mechanics of destruction. In modern theories to explain the destruction of a material of fatigue is considered that the process begins and flow the basis of generation and accumulation of micro-cracking in the material. To describe this process is by using kinetic diagrams of fatigue. The interest to the theory is a discussion of the process of fatigue of middle level. This article examined the kinetic diagrams of fatigue of middle level and evaluate their parameters by ultrasound measurements. 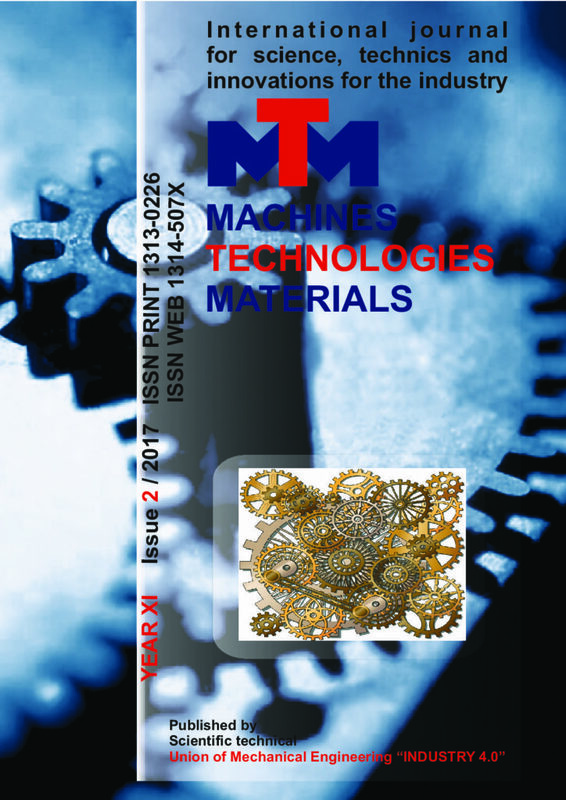 Metal matrix composites, containing Al (4 wt.% Cu) as the matrix material and SiC particles as the reinforcement, were produced by hot pressing. SiC(p) content of the composites were in 10 – 50 vol.% range. Appropriate amounts of Al, Cu and SiC powder were dry mixed and pressed at 25MPa at 525 and 550oC. Obtained composites were subjected to density and hardness measurements, 3 point bending tests and optical microscope investigations. Hardness was seen to increase continuously with the increase in the amount of SiC(p) from 54HB10 (unreinforced matrix) to 148HB10 (50 vol.% SiC). On the other hand, bending strength values of the composites first showed an increase up to 20 vol.% SiC and then decreased. Strain values decreased considerably, with the addition of SiC into the unreinforced matrix and the composites containing 40 and 50 vol.% SiC did not show plastic deformation before fracture. Yield strength and elastic moduli of the composites increased with the increase in the SiC amount. It was seen that the properties of Al%4Cu-SiC(p) composites, such as strength and hardness, can be adjusted by varying their SiC contents. System analysis of impact negative bias potential on structure, substructure and mechanical characteristics of single-layer ZrN and multilayer ZrN/TiN coatings that been obtained by vacuum arc evaporation done at article with the aim of development of direction «Structural Engineering of Nitride coatings». – nano- level (size of areas of coherent scattering (crystallites), microdeformation). Superhard state with the magnitude micro-hardness of 44.8 GPa been reached in ZrN/TiN coatings as a result of using Structural Engineering. Copper alloy-based metal matrix composite (MMCs) reinforced with different combination of WC-W powders were prepared using the spontaneous infiltration process of the loose powders. The density, microstructure, and hardness of the produced composites were characterized. Friction coefficient and wear rate of the samples under different conditions were carried out in order to determine the tribological properties of the copper based composites as a function of different combination of reinforcement mixtures (WC/WC-W). Wear surfaces of the composites were analysed by scanning electron microscopy (SEM). Results show that WC-W powders improve wear resistance of composites significantly. Wear mechanisms were characterized by delamination, micro cracking and abrasive wear. In this paper we study the structure, phase composition, microhardness, wear resistance boride coatings obtained on metals and alloys at complex saturation with boron and copper in various physical and chemical conditions, namely carrying satiation without application of an external magnetic field (EMF) and in its simultaneous imposition . Studies have shown that the use of EMF when applying boride coatings allows in 1.5 – 2 times reduce the duration of saturation detail and get coatings with high hardness and wear resistance. Established that the application EMF on carbon steels formed a continuous, homogeneous boride layer, thickness is 2 times higher than the boriding without EMF. On the diffraction patterns of the surface layers of boride coatings obtained after boriding at application EMF fixed presence phases FeB and Fe2B, the redistribution of the proportion of boride phases, the change of the crystal lattices and the decrease in the volume of the unit lattice phase FeB. When the complex is saturated steel 45 with boron and copper diffusion layer is composed of the phases FeB, Fe2B and Cu. Chemical heat treatment with the simultaneous action of EMF leads to the formation of phases in the diffusion zone FeB and Cu, crack resistance layers obtained after saturation with boron and copper increases to 2.23 MPa · m0,5 compared to 1.12 MPa · m0,5 for boride coatings obtained without action EMF . Formation diffuse boride layers under the action EMF improves tribological characteristics and leads to an increase in wear resistance of 2.2 – 2.6 times.